What happens in the spring, summer, autumn and winter in Salzburg? What is the weather like in Salzburg? The first year in a new city is exciting – new people, new surroundings, new life. In Salzburg there are many events to visit in the first year. Regardless of whether it is music, sport or tradition – it is never boring in Salzburg. WHAT HAPPENS IN SALZBURG IN SPRING? The Dult is a great Fair with a long tradition. It takes place on the exhibition centre grounds. At the Dult you eat home-cooking, drink a cold beer and ride the carousels. Austria is a Catholic country. This is why Easter is a great time to celebrate, because according to the Bible it is the day when Jesus Christ was resurrected. At Easter, a colourful Easter Shrub is tied in Salzburg. New Salzburg residents can experience this tradition on the Residenzplatz, near the Salzburger Heimatwerk. In Salzburg, many people either travel by bus or by bicycle. If you don’t have a bike, come to the Salzburger Radfrühling. At this festival, bicycles can be bought very cheaply. Many authors have lived in Salzburg. That is why literature plays an important role here. At the literary festival in May, the art of writing is celebrated, and readings are held throughout the city. 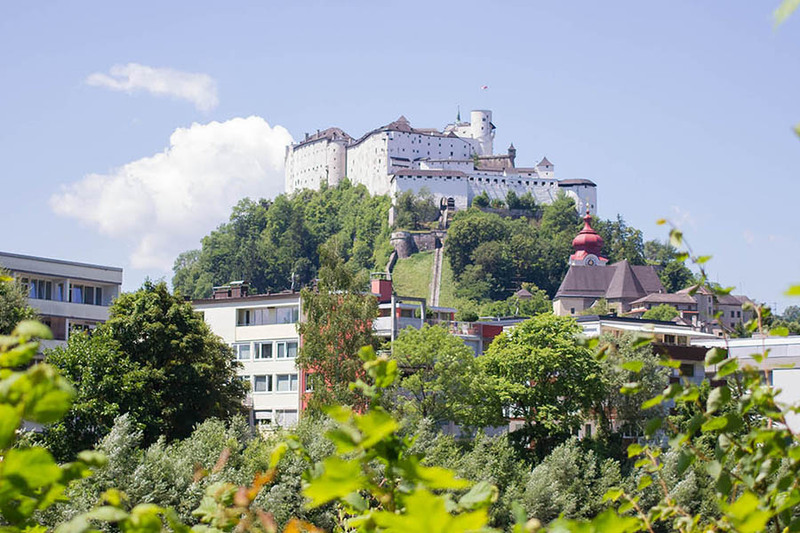 WHAT HAPPENS IN SALZBURG IN SUMMER? Schloss Hellbrunn is a palace and a park close to the city centre in Salzburg. Especially in summer, a visit to Hellbrunn is a lot of fun because the water games are open then. The water games are a tour through a garden where there are many fountains with which guests get wet. In Salzburg you can experience a lot, especially in summer. “Live im Park” is a series of events that take place in Salzburg’s parks. Concerts, sports and markets are organised here outdoors in nature. Admission is free. There are many lakes around Salzburg. In the city, there are several outdoor pools where you can freshen up in the sunshine. There is also a natural pond, the Salzachsee. This is located in Liefering and is a popular meeting place for playing volleyball, swimming and picnicking. WHAT HAPPENS IN SALZBURG IN AUTUMN? Autumn is a real musical time. Jazz concerts are performed throughout the whole city. Admission is free. The Rupertikirtag is a traditional festival in the City of Salzburg. In the old town, food and drink are served, there are many carousels and children especially love this festival that takes place once a year. Salzburg is very well located for hiking fans. There are many mountains around the city that you can climb up. Hiking is also possible in the city. The two local mountains, the Kapuzinerberg and the Mönchsberg are suitable for country walks. Salzburg has several universities and educational institutions. Once a year the Month of Knowledge is celebrated. In autumn, there are numerous lectures, films, workshops and seminars which can be visited free of charge throughout the city. WHAT HAPPENS IN SALZBURG IN WINTER? Salzburg is wonderful in winter. Then, many Christmas and Advent Markets are open. There you can buy good food and drinks, small gifts for Christmas or home-made products from local producers. Going ice skating in Salzburg is a lot of fun. There are some places where you can skate for free if you have ice skating shoes. For example, in the old town of Salzburg, on the Mozartplatz. Or in front of the Europark shopping centre. Ice skating in the ice rink in the Volksgarten is a lot of fun. Ice-skating discos and other events are held there regularly. You can also rent ice-skating shoes there. Salzburg is a good place for sports. Skiing, sledding and snow-shoeing is a lot of fun in winter. If you don’t like snow, try going to the Sports Hall Nord in Liefering. There are many halls there for playing football and other ball sports. If you join a club, you pay less and get to know friends more quickly. The service points for residents provide advice, information and service for all life situations that new Salzburg residents may encounter. The offer is free of charge. Employees of the service points know their facilities and offer advice regarding social topics, healthcare, leisure time and culture. They are familiar with activities that take place in your district and help to avoid detours. Everything is broken? No problem! In the Repair café, hobbyists help you to repair broken things (mixer, vacuum cleaner, etc.). The Repair Café takes place in the Bewohnerservice in Lehen. Austria has four seasons. Temperatures can change from +35°C in summer to -20°C in winter. In summer, there is also often a light drizzling rain, which is called “Schnürlregen” in Salzburg.